Two major forest areas remain in Uganda, the forests around Lake Victoria and those of the Western Rift Escarpment. The forests of the Lake Victoria belt start from Jinja, where the Nile leaves the lake, and continues westward along the northern shore of the lake, down the western shore and toward Tanzania (east of the Nile very little is left of the dense forest that probably covered large areas in former times). These forests also cover some of the islands in the lake. The forest lie around 1 200 m and extend inland for 50 to 60 km. Generally, the hilltops are covered by short grass vegetation, the hillsides by a mixture of cultivated areas and elephant grass thickets and the valleys by forests and swamps. Although there are many different communities in the climax forests in the lake Victoria belt, there is a tendency towards dominance by the genera Celtis, Chrysophyllum, Aningeria, and Piptadeniastrum with lesser important species such as Morus, Holoptelea, Antiaris and Alstonia. Trichilia, Teclea, Lychnodiscus, Lasiodiscus and Acalypha occur in the understorey. The species that usually characterise the succession of secondary forests are Albizia, Antiaris, Blighia, Canarium schweinfurthii, Celtis africana, C. durandii, Entandrophragma, Fagara, Lovoa, Majidea and Pycnanthus. 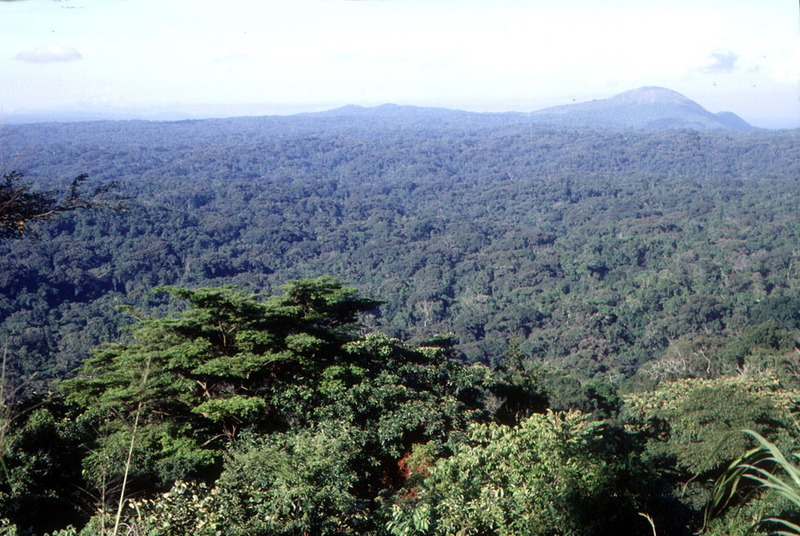 The lowland forests in the Western Rift Escarpment form a belt of large forests between 500 to 1 650 m elevation. The rainfall ranges from 1 250 to 1 625 mm. The forest areas are separated by farmlands and various types of "post-cultivation" vegetation, mainly elephant grass thicket and Hyparrhenia grassland. 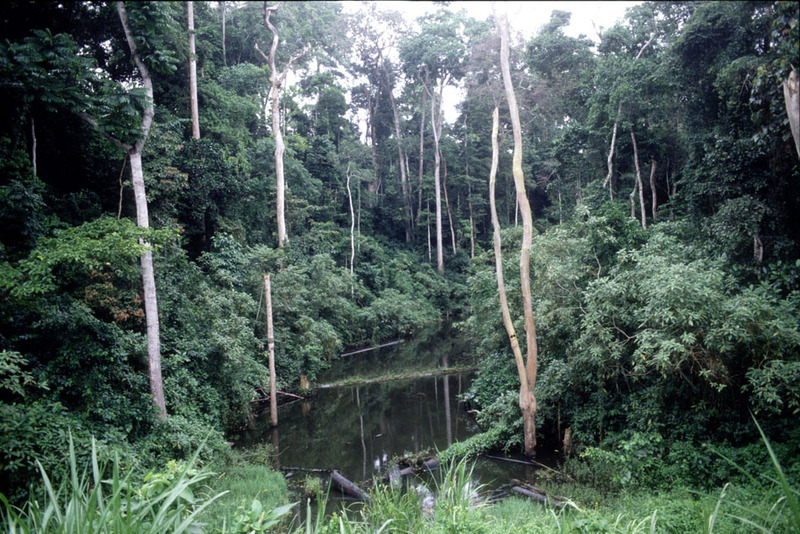 Formerly, many of the existing forests must have been connected with each other and with the Ituri forest in Zaire. These changes must have partly occurred due to climatic variation as it seems unlikely that human activities alone would account for them. These forests, unlike the lake Victoria belt forests, have a tendency toward monospecific dominance. After the initial colonising forest, a mixed forest appears with Alstonia congensis, Trichilia prieuriana, Khaya anthotheca, Celtis mildbraedii, and Cynometra alexandri, among others. Its composition varies from place to place. The climax forest that develops afterward depends on the altitude. From 1 000 to 1 200 m Cynometra alexandri is highly dominant (Uganda ironwood). Lasiodiscus mildbraedii and sometimes by Celtis spp. and Strychnos mitis sometimes dominate the understorey. Very large trees other than Cynometra alexandri occur, such as Khaya spp. and Entandrophragma spp. Patches of characteristic colonising species (e.g. Maesopsis spp.) mature alongside climax canopy species in a mosaic pattern in spaces left by the fall of large trees. Another type of climax community is the Parinari forest, consisting of almost pure stands of Parinari excelsa, associated in the understorey with Carapa grandiflora. Other understorey species are Craterispermum laurinum, Trichilia prieuriana and Pleiocarpa pycnantha. Large patches of lowland bamboo (Oxytenanthera abyssinica) are found in the Acholi and West Nile districts. They are 4 to 9 m high, not very dense, and have a sparse ground layer. Grassland and cultivated areas usually separate the upland forests from the lowland or medium altitude forests. In the Western Escarpment these reach a maximum altitude of about 1 650 m, and from here on, up to about 2 100 m, much of the original forest has been removed. Only in the south-west does continuous forest cover extend from 1 500 m up to 2 400 m, called "the impenetrable forest". The upland forests in Uganda are considered to extend to about 3 150 m. Their composition varies from mountain to mountain, but four principal communities, Juniperus forest, Chrysophyllum forest, bamboo thicket and Hagenia-Rapanea woodland, are found. Depending on the elevation, three zones can be distinguished (lower, intermediate and upper) and in each of them a wetter, intermediate and a drier type. In the wetter lower zone from 1 525 to 2 440 m, Aningeria adolfi-friederici occurs in association with Alangium chinense, Albizia gummifera, Allophylus abyssinicus, Casearia battiscombei, Tabernaemontana spp., Croton macrostachyus, Neoboutonia macrocalyx, Pygeum africanum, Strombosia scheffleri, Syzygium guineense and others. Between 1 200 and 2 700 m, with over 2 200 mm of rainfall, is the Ficalhoa-Afrocrania forest. Pillar wood (Cassipourea malosana) becomes plentiful in some forest areas of Mount Kadam, Mount Elgon and the Imatong Mountains between 2 000 and 3 000 m. The Chrysophyllum forest is part of the impenetrable forest and covers about 30 000 ha of the Rukiya Mountains in south-western Uganda between 1 400 and 2 400 m. Chrysophyllum dominates the higher range while the lower range is dominated by grey plum (Parinari excelsa). Prunus is locally dominant. The most abundant trees are, on the hilltops, Chrysophyllum gorungosanum, Macaranga kilimandscharica and Olea hochstetteri, and on hillslopes Faurea saligna, which forms, in places, almost pure stands 20 m tall. Other species of the upper storey, reaching about 30 m, are Olinia usambarensis, Podocarpus milanjianus, Polyscias fulva and Rapanea rhododendroides. On upper hillslopes, the forest is normally taller and denser than on the ridges. There is a well-defined dominated tree stratum around 18 m high with Allophyllus macrobotrys and Cassipourea ruwenzorensis. The understorey has many Rubiaceae. A common shrub is Cyathula uncinulata. In the intermediate lower zone coniferous forests occur (see below). The drier lower type is not represented in Uganda. The intermediate one is characterised by bamboo. The largest areas of mountain bamboo occur in the Ruwenzori Mountains, the Virugna volcanoes, and the Echuya reserve on the Ruchiga Mountains in the south-west. The bamboo Arundinaria alpina is the main species, growing over 10 to 12 m high in dense even stands on good soils. The upper zone usually consists of low woodland from 12 to 18 m, with Hagenia abyssinica accompanied by Rapanea rhododendroides and Hypericum spp. or Sambucus spp. Species of the swamp forests of the lake Victoria belt include Bombax reflexum, Cathormion altissimum, Cleistanthus polystachys, Erythrina excelsa, Euphorbia teke, Macaranga schweinfurthii, Mitragyna stipulosa, Parkia filicoidea, Phoenix reclinata, Pseudospondias microcarpa, Spondianthus preussii, Treculia africana, Beilschmiedia ugandensis, and Voacanga optusa. The canopy seldom exceeds 24 m. The lower stratum consists mainly of Raphia spp., Tabernaemontana spp. Voacanga spp., and sometimes Phoenix reclinata. In the south-west, forests occur sporadically on swampy ground with Myrica kandtiana, Rapanea rhododendroïdes and Syzygium cordatum. They have a canopy height of approximately 10 m.
Forests with a significant proportion of coniferous species exist in several places. In the lower and intermediate zones of the upland forests some small patches of Juniperus forest (Juniperus procera) occur which are presumably relics of some larger communities. In the same zone a mixed forest exists with Podocarpus gracilior and Juniperus procera, in association with Ocotea spp., Olea spp. and other upland hardwoods. Along the western shore of Lake Victoria, on elevated lake and river deposits with clayey soils there is evergreen two-storeyed forest with Podocarpus usambarensis var. dawei and Baikiaea eminii as dominant trees. Podocarpus usambarensis has been heavily exploited. In some places P. usambarensis is replaced by P. milanjianus. Most of the exploited areas have an understorey of Lasiodiscus milbraedii. The upper canopy reaches 30 m and the lower storey 15 m.